From the moment you start with genealogy in the Netherlands you will be confronted with the Dutch language. Most foreigners are convinced that Dutch is one of the most difficult languages to learn. I think it is quite simple, but I guess everybody says that about his/her mother tongue. Although the internet offers a lot of help with translations, most websites give only a translation and not an explanation of the word. 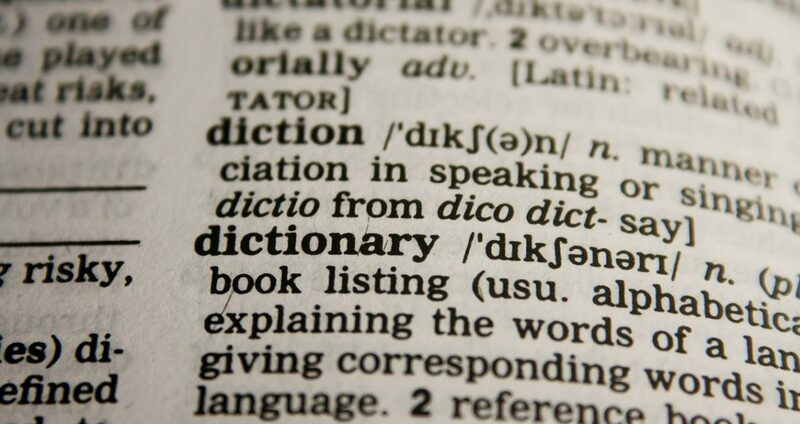 In this article I will help you to start with understanding some Dutch words. I chose to make an ABC list. For some letters I could not find a useful Dutch word, so I left those out. For other letters I could find multiple words, so I simply had to choose one. Most Dutch addresses contain two elements: the name of the street and the number of the house. The house number is placed behind the street name. For example: Hoofdstraat 11. Keep in mind that these kind of addresses often exist from the beginning of the 20th century. In earlier times streets had no names and houses could be renumbered all the time. A lot of Dutch cities and villages used letters and sometimes a name to indicate a neighborhood (wijk). For example: C-12 or Heikant 512. Do not confuse an address like C-12 with the cadastral number C-12. This might be a completely other house! Professions in the Netherlands are similar to those in other countries. A few examples: boer or landbouwer or bouwman (= farmer), dagloner (= day worker), bakker (= baker), wever (= weaver), timmerman (= carpenter), schilder (= painter), slager (= butcher), veldwachter (= constable), onderwijzer (= teacher). Most wives did not have a profession but stayed at home to take care of the household and the children. Unmarried, often young, women would work as a dienstmeid (= servant) until their marriage. Baptisms are found in church registers. Civil registration records never mention baptisms as they were (and are) considered to be a religious event. Most of your Dutch ancestors were baptized in the Roman-Catholic church or the Dutch Reformed Church, although other denominations did (and do) exist. The earliest baptismal registers were started at the end of the 16th century. Information about inheritances can be found in records of the notaris (= notary) or the schepenbank (the city or village court, that existed until 1811). A good source for inheritances in the 19th and 20th century is the memorie van successie. All the deceased’s properties and belongings were listed together with an overview of the heirs, for death tax purposes. The word folio is often used in archival publications or finding aids. It can be a single piece of paper or a page in a register or book. The difference between a folio and a bladzijde (= page) is that a folio is numbered only on the front side and not on the back side, whereas pages are numbered on both sides. The backside of a folio is often indicated by the word verso or the letter v (as an abbreviation of the word verso). For example: folio 11v. The best place to look for birth records is the burgerlijke stand (= civil registration). From 1811 on births were registered by the gemeente (= municipality). Everybody with personal knowledge of the birth could be an aangever (= informant). Most of the times the father was the informant, sometimes it was the geneesheer (= doctor) or the vroedvrouw (= midwife). Until 1934 two people were required as a getuige (= witness). After 1811 marriages were (and are) performed by the ambtenaar van de burgerlijke stand (= civil registrar). 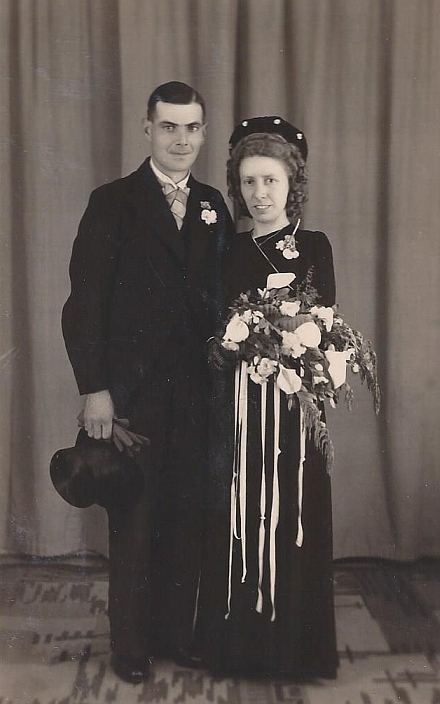 Marriage records provide with a lot of information about the bruidegom (= bridegroom) and bruid (= bride): age, place of birth, sometimes date of birth, parents, profession, and residence. For a long time four witnesses were required, nowadays the minimum is two. Before 1811 legal marriages were performed by the dominee (= minister of the Dutch Reformed Church) or by the schepenbank. When looking for documents in archives, an inventaris is very useful. Take a look at the whole text because it might start with a description or history of the organization that produced the documents. In a well-written inventaris each archiefstuk (= item) has its own inventarisnummer (= item number, abbreviated as inv.nr.) that can be used to refer to. A ‘standard’ Dutch source reference contains the name of the repository, the name of the archive, the inventarisnummer and the folio or bladzijde number. For example: Regionaal Archief Tilburg, Archief van de gemeente Loon op Zand, inv.nr. 368, folio 12v. Parts of the Netherlands (for example Holland, Zeeland and the southern provinces) used the Gregorian calendar since 1582: Thursday 4 October 1582 was followed by Friday 15 October 1582. Other provinces used the Julian calendar until 1700 or 1701. 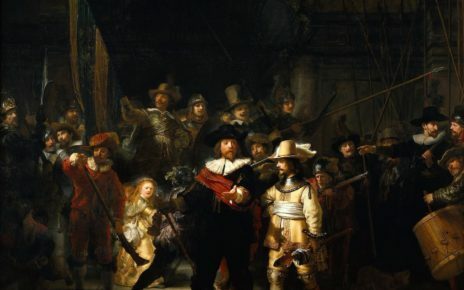 Since 1576 it was quite common in the Netherlands to start the year at the 1st of January. Before 1576 in most areas the new year started either with Pasen (= Easter, each year a different date) or Maria Boodschap (= Feast of the Annunciation, the 25th of March). Newspapers are a rich source for reading about general historical events or looking up personal details. The website Delpher contains more than 12 million images of Dutch newspapers. 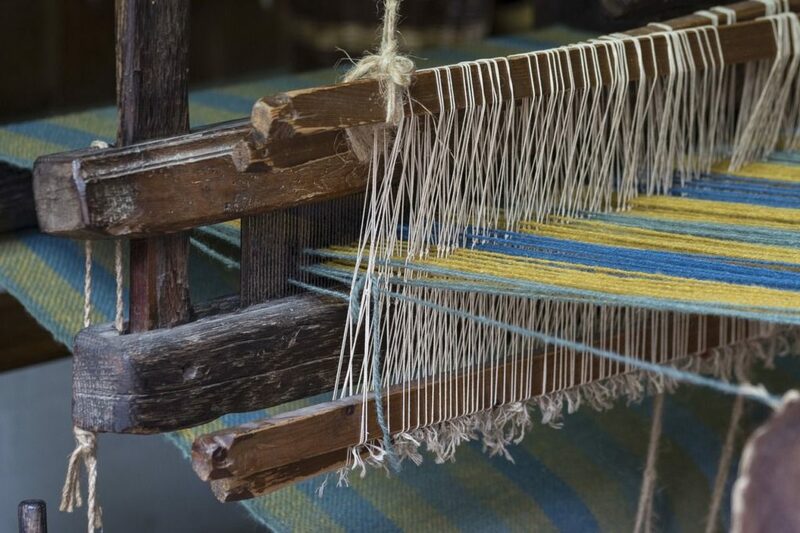 The oldest are from the beginning of the 17th century, the most recent ones from 1995. Genealogists who are looking for names and dates of family members in the 20th century should search the familieberichten (= announcements of births, marriages and deaths). The protestant churches registered church members in their lidmatenboek or lidmatenregister. The minister would write down the names of his church members, often with information about their belijdenis (= confession of faith). For new church members he would mention their last residence. For those who left his church, he would write down their destination. With this kind of information it is a bit easier to get an idea about migration in the 18th century. The twelve months are called januari, februari, maart, april, mei, juni, juli, augustus, september, oktober, november and december. Sometimes old names are used: louwmaand (January), sprokkelmaand (February), lentemaand (March), grasmaand (April), bloeimaand (May), zomermaand (June), hooimaand (July), oogstmaand (August), herfstmaand (September), wijnmaand (October), slachtmaand (November) and wintermaand (December). Each person has a voornaam (first name) and a achternaam or familienaam (last name or family name). Dutch people do not use middle names. Sometimes a person has more than one voornaam. In some cases a person is called by his first name, in other cases he/she has a separate roepnaam. For example: my three voornamen are Johannes Adrianus Henricus, but my roepnaam is John. Most Dutch family names can be divided in four big groups: family names derived from occupations (for example: de Bakker), from places (often with the word van; for example: van Deventer), from patronyms (father’s name, occasionally mother’s name; for example: Jansen), from personal descriptions (for example: de Lange). After 1811 deaths were registered by the gemeente. Everybody with personal knowledge of the death could be an aangever (= informant). In most cases the informant was a relative (for example the husband or a son), or a neighbor. Later on, the role of informant was taken by a begrafenisondernemer (= undertaker). Dutch death records do not mention the cause of death. Between 1939 and 1994 all living persons in the Netherlands were registered in a card system. The persoonskaart contains a lot of useful information: names, date and place of birth, date and place of marriage, addresses, name of parents, spouses and children. When a person moved from one place to another, the card would follow him/her. Once a person had died his/her persoonskaart was sent to the Central Bureau for Genealogy in The Hague. Genealogists can order a copy of these cards for approximately 4 euros. A register is a book that contains multiple, often similar, items. For example: a doopregister. Genealogists will come across the word DTB-registers. DTB is the abbreviation for dopen, trouwen and begraven (= baptisms, marriages and burials). Another word, frequently used in Belgium, is parochieregisters (parish registers). Before 1811 divorces were very rare; they can be found occasionally in schepenbank registers. Since 1811 the gemeente has recorded the divorces in the marriage registers. 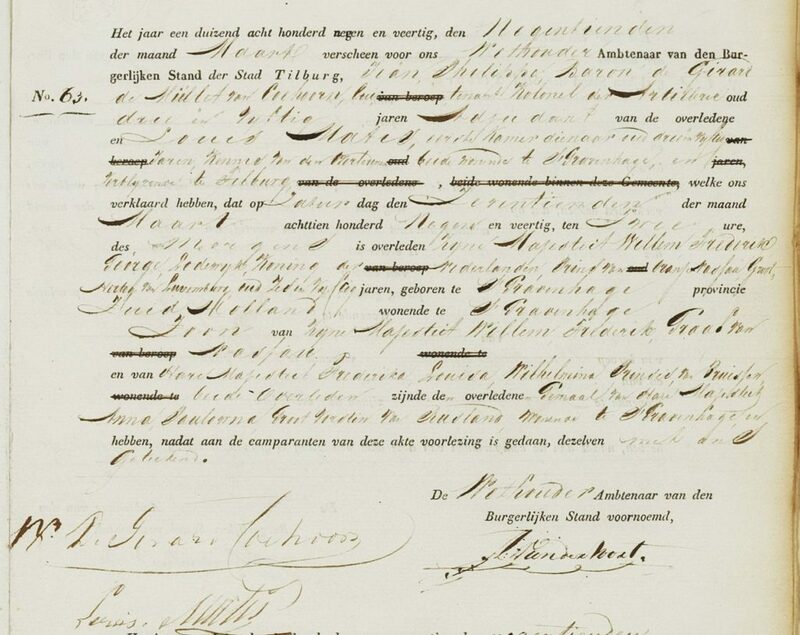 After a court has agreed to the divorce, de gemeente writes down the sentence and refers to it in the margin of the original marriage record. A scheiding van tafel en bed (= a separation of table and bed; an informal separation) is not registered. The first testaments were recorded by priests; most of these testaments were not preserved. In the 17th and 18th century testaments were registered by either the schepenbank or the notaris. The text would generally start with the words In de naam des heren, amen (= In the name of the Lord, amen). After 1811 testaments could only be made by notaries. On behalf of the heirs a notary can search for testaments in the Centraal Testamentenregister. This database contains only the name of the person who made a testament, the date of the testament and the name of the notary who registered the testament. Most people hold funeral services for their beloved ones. The service can be held in a church, a funeral home or another place. After the service follows the begrafenis (= burial) or the crematie (= cremation). Cemeteries are either a kerkhof (= churchyard) or a gemeentelijke begraafplaats (= municipal cemetery). The uitvaart, begrafenis and crematie are not registered by gemeente, although a permit is required. Information may be found in newspaper announcements. Roman-Catholics offer bidprentjes (= In Memoriam cards) to those who attend the uitvaart. These cards may have a photograph and/or personal details of the deceased. The first national census in the Netherlands took place in 1811. Other national censuses were taken in 1830 and 1840. A census register lists all the people who keep residence in a gemeente. Name, date of birth (or age), place of birth, occupation, religion and address may be written down. Census information is often not reliable. 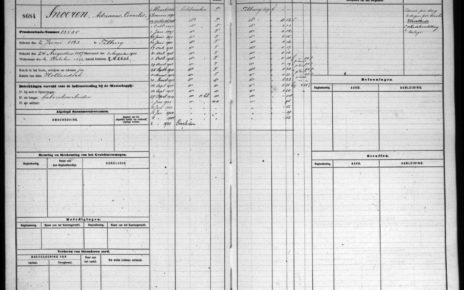 In 1850 censuses were replaced by bevolkingsregisters (= population registers). In these registers all changes in a household (including migration) over a period of ten or sometimes twenty or thirty years were registered. 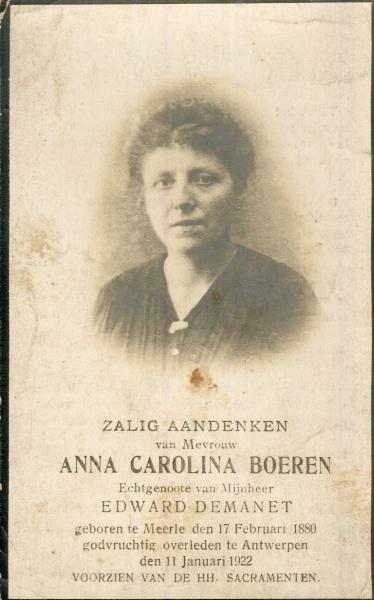 In 1920 the bevolkingsregisters were replaced by gezinskaarten (a card with information about a family) and in 1939 the persoonskaart was introduced. According to Dutch law each person in the Netherlands should be registered by a gemeente. Thus, each person has a legal residence. It does not always mean a person is actually living in that place. A captain may be a legal resident of Rotterdam, while travelling by boat from city to city. A mine worker may be a legal resident of Tilburg, while staying in the province of Limburg to work in the cole mines. Sometimes civil records state that a person is zonder vaste woon- of verblijfplaats (without a fixed residence). This means that the person has left, without informing gemeente or relatives where he/she has gone. Without any other clues, it will be very difficult to find this person. This article was first published in Going In-Depth 3 (December 2015): 29-34; e-magazine (www.theindepthgenealogist.com). Were your ancestors guild brothers? We have created the perfect help for you! The Dutch Genealogy Legacy QuickGuide contains valuable research strategies to help you find your Dutch ancestors. This handy 8-page PDF guide can be used on your computer or mobile device for anytime access.Legacy also offers a webinar called ‘Help, They Are Dutch! Tracing Your Ancestors in the Netherlands‘.